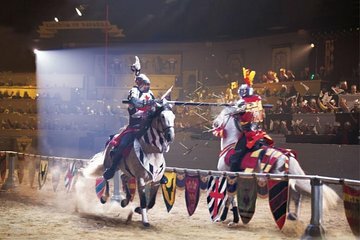 Enjoy a royal feast and thrilling tournament in Myrtle Beach with tickets to Medieval Times, and spend an evening in a sumptuous castle lined with armor, artifacts and coats of arms. See a thrilling display of falconry and horsemanship as you linger over a four-course, medieval-style meal. Listen to the pounding of hooves in the Grand Ceremonial Arena, cheer your personal knight through a series of jousting matches, then see Queen Maria Isabella crown the evening’s champion with plenty of pomp and fanfare. We were told to be there 1 hour early. After going inside we were ushered right back outside to wait 45 min. in 100 degree heat, no explanation. After getting inside, we were led to a sales table for Holiday Inn, We didn't want a sales pitch, we came for entertainment and food. We sat in a large hall waiting to be seated for another hour then we finally went into the dining/entertainment area and were escorted right back out because they were not ready. Approximately two hours of our vacation passed, while we did nothing. I felt this was unfair and insulting. Dialog hard to understand. Program a little slow at first but events were interesting and fun to watch. Didn't appreciate having to stand in line to be "encouraged" to upgrade our tickets after we bought advance tickets to avoid standing in line.